Developing innovative technology that saves money is the ultimate goal of the leading global supplier of radio frequency identification (RFID) antennas and readers, FEIG ELECTRONICS. Recently, this innovative technology was awarded Honorable Mention at the Security Industry Association’s (SIA) New Product Showcase (NPS) at the ICS West 2018 trade show received an honorable mention for the Access Control Devices & Peripherals Wireless Best New Product Award. The ISC (International Security Conference & Exposition) West is the biggest event in the U.S. for the security integrators for the physical security industry. This event hosts vendors who offer products for a wide array of security sectors, including networked security products, CCTV and video surveillance, IP security, biometrics, alarms and monitoring, access control, and much more. “The fact is, the ISC West SIA hosts some of the most innovative technology in the security industry. As a result, receiving recognition as an honorable mention is a huge honor, and one that FEIG ELECTRONICS hopes to improve on in the near future,” states Klaus Schoeke, technical sales director at FEIG ELECTRONICS. The existing vehicle access control applications featuring two lanes require the use of two separated RFID readers. 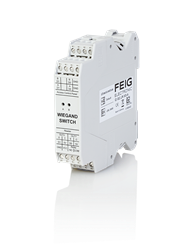 Now, with the help of innovation from FEIG ELECTRONICS’ Weigand Switch -- only one reader is required. This is a just one example of FEIG's goal to put customers first by focusing on solving their problems and creating a simple and easy customer experience. FEIG ELECTRONICS also has other security-based technology products to help with vehicle access control and personal access control and time recording for standalone systems or to connect to existing access control systems. For more information, contact FEIG ELECTRONICS directly at info(at)feig-electronics.com. FEIG ELECTRONICS is one of the few RFID manufacturers worldwide offering RFID readers and antennas for all standard operating frequencies: LF (125 kHz), HF (13.56 MHz), UHF (860-960 MHz). A trusted pioneer in RFID with more than 50 years of industry experience, FEIG delivers unrivalled data collection, authentication and identification solutions, as well as secure contactless payment systems. FEIG readers, available for plug-in, desktop and handheld applications, supports next-generation contactless credit cards, debit cards, smart cards, NFC and access control credentials to enable fast, accurate, reliable and secure transactions.